Ava DuVernay's Career Advice: "Follow the White Guys. They've Got This Thing Wired"
Home advice Ava Duvernay black directors black filmmakers black panther speeches Ava DuVernay's Career Advice: "Follow the White Guys. 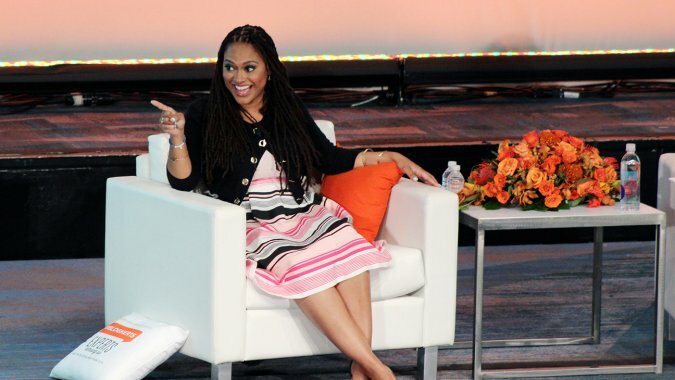 They've Got This Thing Wired"
Ava DuVernay offered some advice as part of her keynote speech at this year's BlogHer conference, which aims to empower women who are digital content creators and influencers. "You gotta follow the white guys. Truly. They've got this thing wired." DuVernay added, "Too often, we live within their games, so why would you not study what works? Take away the bad stuff — because there’s a lot — and use the savvy interesting stuff and figure out how they can apply. It’s a good one for the ladies." She spoke about how women have been trained by our society to ask instead of taking what they want. "We've been really indoctrinated with this culture of permission. I think it’s true for women, and I think it’s true for people of color. It’s historic, and it’s unfortunate and has somehow become part of our DNA. But that time has passed." DuVernay also expanded on her decision to pass on directing the upcoming Black Panther during her speech. "What my name is on means something to me — these are my children," she said. "This is my art. This is what will live on after I’m gone. So it’s important to me that that be true to who I was in this moment. And if there’s too much compromise, it really wasn't going to be an Ava DuVernay film."